Why such a rich history? Besides the fact that many early Americans had roots in whiskey-producing countries like the British Isles, perhaps it was the sheer simplicity of the whiskey-making process, which only requires water, fire, and grains. And a distillery to house them, of course. Although it’s no longer operational, George Washington’s Distillery at his estate at Mount Vernon has been there since 1797, when a Scottish farm manager suggested it would be a good business venture. Obviously we can’t talk about American whiskey without spending some time in Kentucky. Heaven Hill Distillery produces a number of spirits, most importantly Evan Williams Bourbon, which is the first whiskey on record produced in the state, dating back to 1783, when Kentucky was still a county in Virginia. The 1930s-era warehouses pictured are where bourbon is aged. Next stop on the Bourbon trail? Jim Beam, which has been distilling whiskey for more than 200 years. Image credits: Left image by Jamie Bernstein on Flickr. Right upper image also by Jamie Bernstein on Flickr. 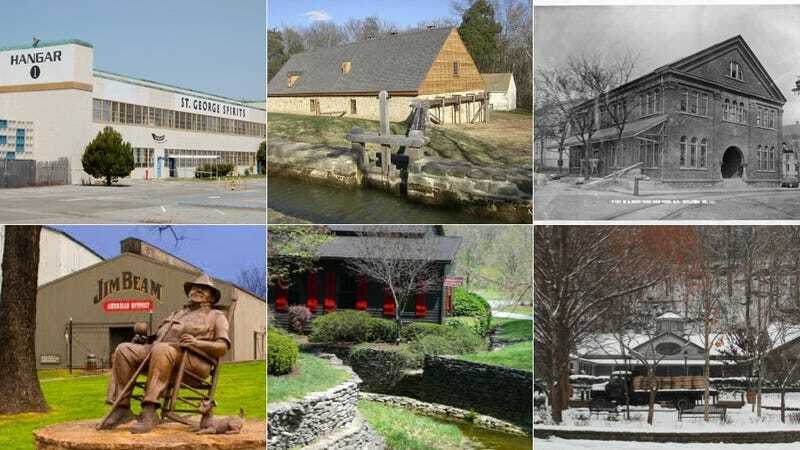 Maker’s Mark might be a newer name when it comes to old whiskey—it’s only been produced since 1954—but its facilities are timeless, listed on the National Historic Register of Places since 1974. Of course, we must travel down to Tennessee to visit our old friend Jack Daniels, which has been making sour mash whiskey in square bottles out of Moore County since 1866. Included in the National Register of Historic places, it’s the sole remaining distillery in a county where there were once 15. Willett is a bygone distiller of Bourbon and Rye that has recently been resurrected. Shuttered until the 1980s, the Willett family-owned parent company just began making test batches in January 2012. Unfortunately, because of the aging process, you’ll have to wait a couple of years to have a taste. Kings County Distillery is the oldest New York City whiskey maker, and it was the city’s first distillery out of the gate when Prohibition ended. It’s housed in the Brooklyn Navy Yard’s 113-year-old Paymaster Building. Tuthilltown Spirits also gets some New York street cred—it was the first distillery in the state opened after Prohibition. Like many old fashioned distilleries, it also has a gristmill. And now for something completely different, St. George Spirits, a craft company housed in an old, 65,000 square-foot airplane hangar.